Breaking your key off in the ignition is easily one of the most frustrating things that can happen to a driver, leaving you feeling helpless and stuck. You may still require the assistance of a key removal expert, but nothing is stopping you from trying a few tricks to DIY out of a pricey visit from a locksmith. So, resist the urge to repeatedly jam the broken end of your key into your ignition (making it worse), grab a couple of household tools and give these ideas a shot. If there’s even a fragment of visible key sticking out of the ignition, you can use needle-nose pliers to pinch the end of the key and pull it straight out. Supercharge your pliers by adding bonus grip to the business end. Use super glue, melted wax, or putty on your tool’s tip, latch onto the key piece with your pliers and pull the key out. If using super glue, wait for the glue to set first before pulling the key out. Also make sure you clean any of these substances off your pliers with cotton swabs and acetone before you put the pliers away. If using pliers doesn’t work, often a wire coat hanger will. Shape one end of the wire hanger into a hook with your pliers, insert this wire hook into the ignition and give a swipe to dislodge the broken pieces. If your car is stuck in the locked position and the pliers, pliers/glue, or coat hanger methods fail, put your ignition in “neutral” and grab a small hacksaw blade. Slip the blade into the ignition so it lies against the broken key and turn the ignition so that’s it’s no longer locked in place. When you extract the hacksaw blade, if you’re lucky it will grab onto the front or back of the key and you can drag it out. Be careful of your hands and your interior trim if you try this method! After all this, if you still can’t get the key out, spray some cooking spray or WD-40 inside the ignition unless you want to use the pliers again, as the lubrication will make the key too slippery to grab. Then all you need to do is pull the key out with your hacksaw blade, and the lubrication will help the broken key slide right out. 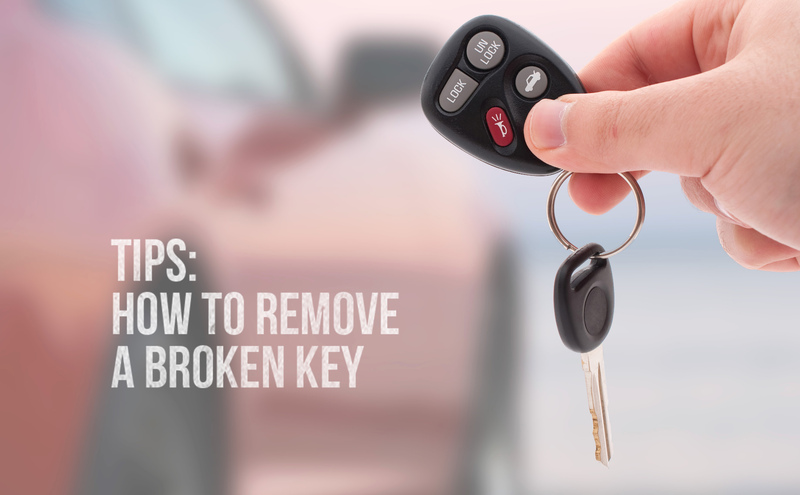 Hopefully your can get the broken key out of your ignition with one of these DIY methods. If you have any questions, just give us a call.